Early hours of this morning we received a phone call. It is a phone call we have been waiting for, a call we have been expecting but nothing quite prepares you. 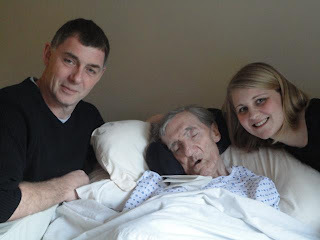 My Grandad sadly passed away this morning. He is in a better place now and is no longer suffering. He has suffered with Parkinson's disease for the past 25 years. I never knew him before the disease began taking over his body. For the past 5 years it held him prisoner in his body, he was unable to do anything for himself and relied on my Nan to care for him, other then times he was taken into hospital or for the past 5 weeks where he has been living in a care home. My Nan didn't want him to go into a home, but it was the best thing for both of them, his body had given up. I was going to see him tonight, everyone managed to get to see him before he passed away, I was the only one who didn't get there in time. I had missed him. They lived in Mill Hill, North London. the last time I saw him alive was Christmas Eve. He was the best I had seen him for a long time, and we laughed a lot that day. It was lovely to see him smiling and laughing again and that is a memory I will hold onto forever. I have been to see him today, he looks at peace now and it was comforting to see him that way after so many years of suffering. Rest In Peace Grandad, you will forever be in our thoughts and in our hearts. The funeral is a week on Thursday and we will be collecting for Parkinson's. I thought it would be nice to see what I could raise myself in his memory and to support the thousands of people effected by this disease, whether it be the patient themselves or like me a relative / loved one. I have created a Just Giving Page if you wanted to make a donation (although I know times are hard so if you can't donate please don't worry) I thank you so much in advanced for any donation given no matter how small. So sorry to hear about your Grandad. My thoughts are with you and your family. So sorry to hear this. At least he is at peace now. Thinking of you. I am so sorry for your loss. I lots mine a year ago and nothing prepares you for it. At least he is not suffering any more but that knowledge won't make your pain much easier. I'm Sorry, Gemma. What a loss. I lost my father recently to ALS and I know how hard it is to watch someone dwindle in health so horribly. My thoughts are with you. Oh Gemma, bless you all, I'm so sorry- I hope you are ok and I'm sorry you didn't get to see him today, that must be horrible for you. I hope you can rejoice in the happy memories of him. Gem. My prayers are with you and your family. Hugs to you my love. I've seen the toll Parkinson's can take on everyone in the family. My heart goes out to you and your Nan. May your sweet memories bring you comfort. So sorry - even if you know the call is coming, its still hard to deal with it when it does come. I'm really sorry for your loss. Like you said he is in a better place. And the last time you saw him was a great memory to hold onto forever. Gem, so sorry to hear your sad news but glad that your grandfather is no longer in pain. I've made a small donation.